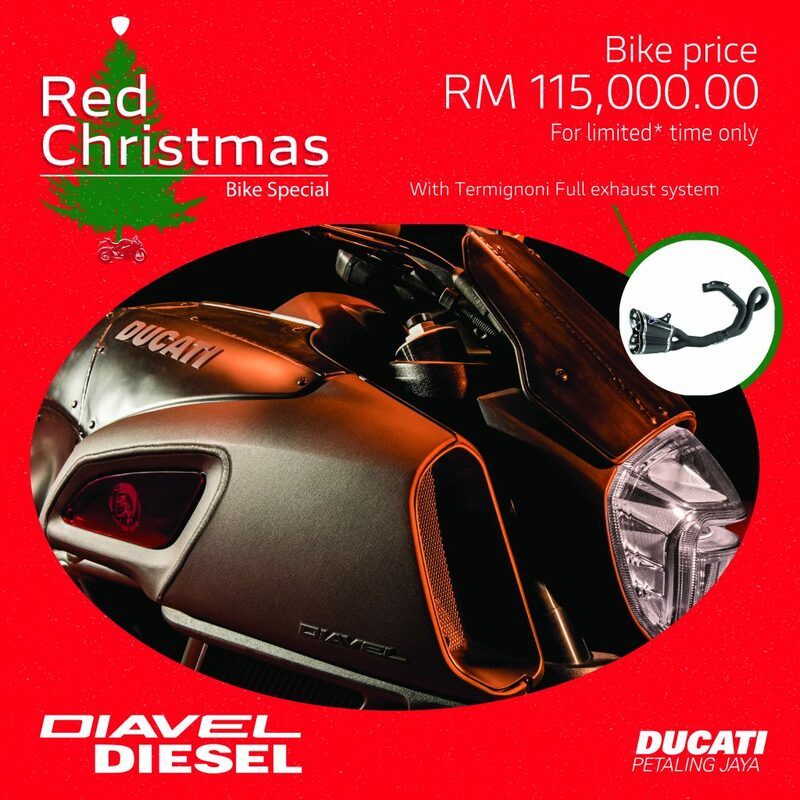 Home Year 2018 Ducati Malaysia Offers Rebates up to 80% this Ducati Red Christmas! 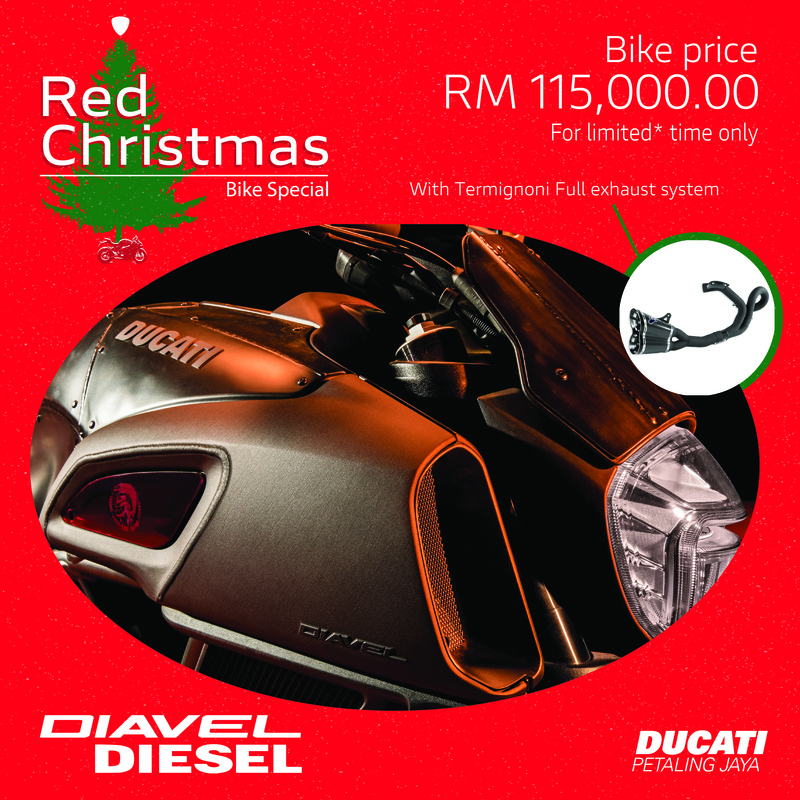 Ducati Malaysia Offers Rebates up to 80% this Ducati Red Christmas! 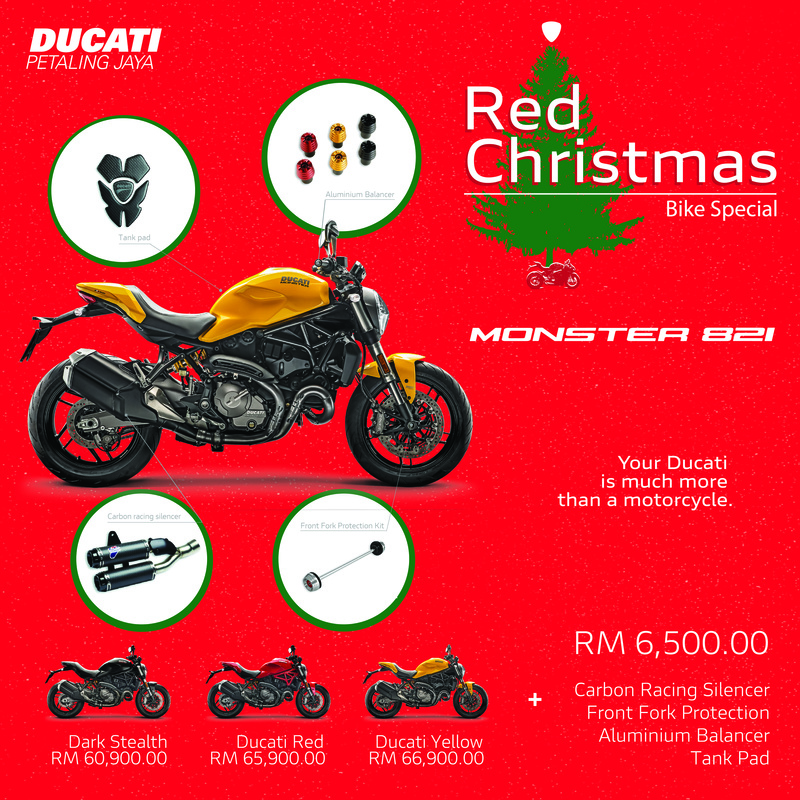 Ducati Malaysia is making this holiday extra merry by offering rebates of up to 80%. 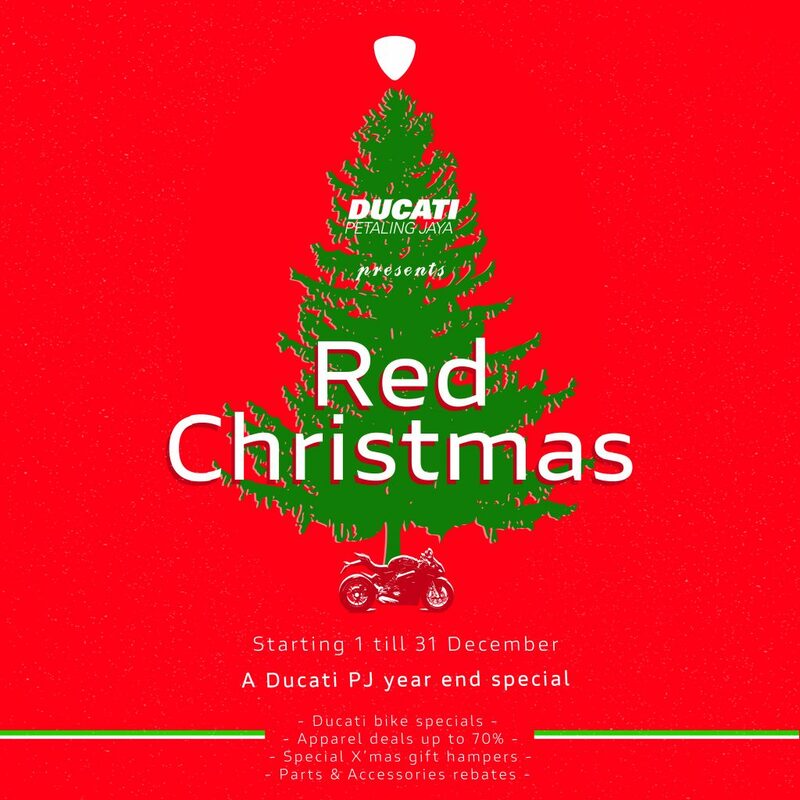 The Ducati Red Christmans Year-End Special promotions will have Ducati fans seeing 2018 out on a sweet note. There are savings on bikes, accessories, besides promos on Desmo service and free 15-point check. Ducati fans are in for a merry year-end treat as Ducati Malaysia is offering rebates up to 80% during the Ducati Red Christmas Year-End Special promotion. Customers can now own a Diavel Diesel at just RM115,000 onwards.The Diesel edition embodies the timeless and Diesel’s hard rock DNA, complete with a Termignoni full-system exhaust package. Up to 70% on Ducati and Scrambler Ducati apparel until 2nd January 2019 at the official Ducati merchandise shop in Ducati PJ. To celebrate the jolly season, customers are encouraged to take this opportunity to gift their loved ones with festive Ducati merchandise gift sets. Up to 80% for Ducati accessories and spare parts from 10thDecember 2018 to 13thJanuary 2019. Customers will also be treated to a 25% rebate for Desmo service parts as part of its pre-purchase program. To sweeten the deal, customers with minimum spend of RM600 in a single receipt will bring home a complimentary authentic Ducati T-shirt worth RM250! 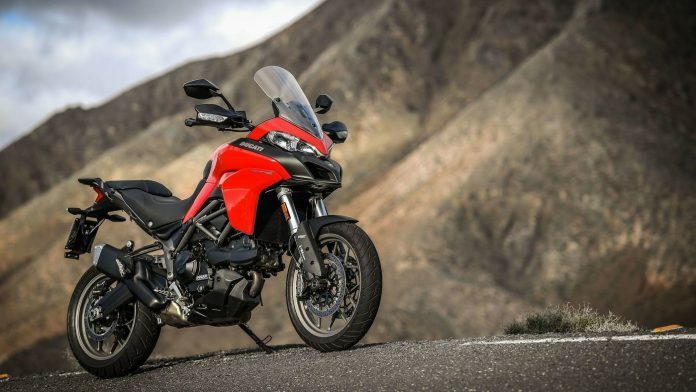 Ducati Malaysia will also be providing a free 15-point check at the Ducati Service Clinic Ducati Malaysia from 21st– 23rdDecember. This special value added service is available from 10am to 5pm and is open to all Ducati models, including official imports and grey import bikes. 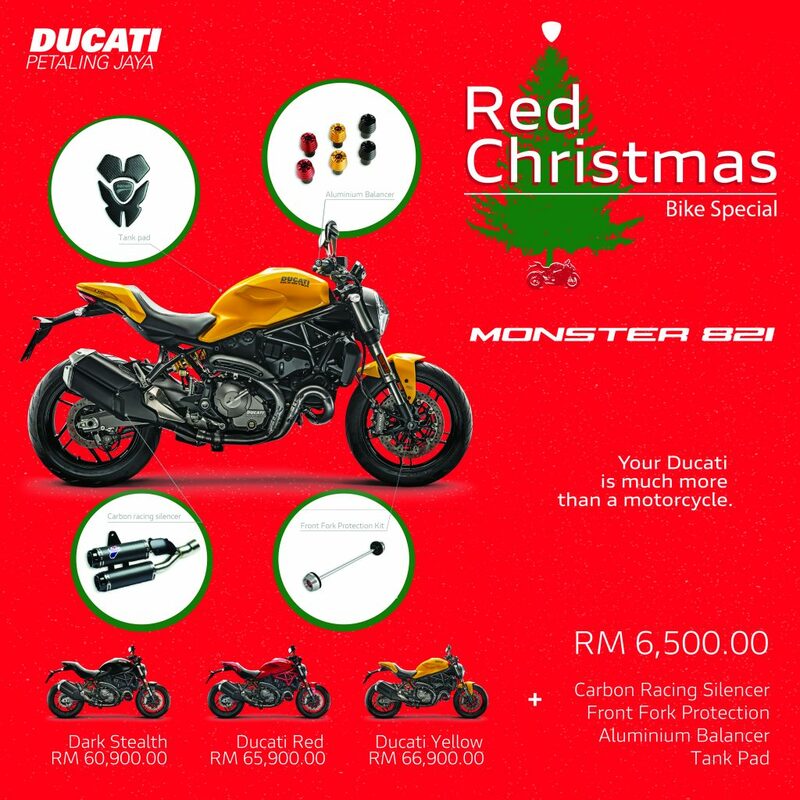 So head over to Ducati Malaysia for this great Ducati Red Christmas! For more information, fans can visit Ducati Malaysia’s Facebook page at https://www.facebook.com/DucatiMY/ or Instagram page at https://www.instagram.com/ducati_my/.